Beautiful certificate from the Corrington Air Brake Company issued in 1903. This historic document was printed by the Adams & Grace Company and has an ornate border around it with a vignette the New York State Seal. This item has the original signatures of the Company’s President, Murray Corrington and Secretary, and is over 109 years old. 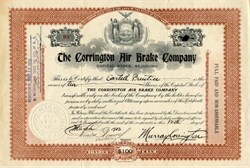 The Corrington Air Brake Company, of New York city, was incorporated in Albany, N. Y., recently with a capital of $5,000,000 to manufacture air, electric and other brakes and appliances for locomotives, cars and vehicles. The directors are John N. Beckley, Frederick Cook and John F. Alden. of Rochester; K. W. Blackwell, of Montreal; Elias Rogers, of Toronto; Henry M. Watson, of Buffalo; John P. O'Donnell, of London, England, and William G. Choate, Coleman Hanford. Nelson Shipman, Joseph Larocque. Jr., Charles F. Gehrmann. Charles Hansel, Clarence A. Hope and Murray Corrington, of New York city.